A number of statups in accelerators have attacked the music collaboration space. It seems artists and musicians everywhere are looking for the best way to hop online and collaborate with each other. Back in May we saw the demo day presentation from Memphis Seed Hachery startup Musistic, promising to be the Github for musicians. Collabra Music, a startup currently accelerating at Velocity in Indiana (outside of Louisville), is taking that idea a step further by adding friends, family, and fans into the mix. Collabra Music is about collaboration as much as it is about sharing, performing and discovery. “We have a big vision for Collabra that connects amateur and independent musicians across the world, creating a collaborative space that inspires new innovation in musical creation and integrates listeners like never before. In developing Collabra and working with many musicians, we came across a common problem, especially for amateur musicians and music students. Many musicians felt that Collabra could help them overcome their struggles in learning, enhancing their experience, and engaging them with their musical practice in more rewarding ways,” co-founder Ryan Michaels told us in the Fastlane interview. Check out the rest of their Startups In The Fastlane interview below. Where is your startup originally from? Tell us about your current team? Our CEO Ron Karroll is a self-starting non-conformist with a penchant for coding that has been the driving force behind the development of our core product. Ron left his full time job with Humana to lead the charge for Collabra Music and help launch what he hopes will be the next evolution in musical creative collaboration. Ron determination and drive is buffered by his cautious and calculating musical co-founder Ariel Caplan. Ari is an actuary and master of data and analytics. He and Ron developed the vision together, outlining a new methodology that speaks to today’s participatory listener audience. While Ron mans the software development Ari manages the financial and organizational development for Collabra Music. As musicians they were both passionate about creating a product that bridged the physical gap between musicians as well as fans connecting to create and collaborate on musical projects online. Ryan Michaels loves music, he simply loves to listen and he’s always learning guitar. Ryan is well-versed in lean methodologies, grassroots organizing and fundraising. He has diverse experience in customer service, education, and community outreach. He joined Collabra to help develop and execute our marketing strategy and solidify our core team and organizational structure. His energy is pretty much limitless. Collabra Music is an online platform that allows members to connect to create music, collaborate on musical projects, and share their projects online with friends, family, and fans. We have a big vision for Collabra that connects amateur and independent musicians across the world, creating a collaborative space that inspires new innovation in musical creation and integrates listeners like never before. In developing Collabra and working with many musicians, we came across a common problem, especially for amateur musicians and music students. Many musicians felt that Collabra could help them overcome their struggles in learning, enhancing their experience, and engaging them with their musical practice in more rewarding ways. Collabra is a solid platform for creative collaboration and now we are releasing the alpha phase of our educational layer for instructors and students to connect and engage through the often painful process of learning an instrument. Collabra connects musicians together to help and hold one another up through the creative and experiential challenges they may face, keeping them committed to their passion for music. What are your goals for the accelerator program? Our goals for the accelerator have been somewhat informal as we truly didn’t know what to expect of this experience. We have spent significant time outlining our customer segments, engaging in discovery, validating hypotheses, and formatting our business model. In addition Velocity has been helpful in outlining a number of mistakes and failures we most likely would have made without a cautionary example in education. The knowledge, training, and experience this has provided our team is invaluable and we are incredibly grateful for the relationships we have built this summer. What’s one thing you’ve learned in the accelerator? The one thing lesson we learned the most frequently is to appreciate the values in our failures and to embrace our failures along the way for what we could learn from them and apply to future successes. The accelerator encourages you to act on the information you have and hope to succeed but prepare to fail, from every failure a lesson can be carried forward and applied to increase the chances of your next attempt at success. We also learned to be honest and aware of our team’s strengths as a team as well as the strengths and weaknesses of our individual members. Embracing this awareness has allowed us to act to balance one another strengths and weaknesses. What’s the hardest piece of advice you’ve had to stomach so far? The most difficult advice has not been a specific fact or direction, but rather the fact that nearly every piece of advice we’ve received has in some way contradicted the advice of another mentor. What started as a carefree balancing act of pursuing a few courses of action has snowballed into a high speed cross-fire environment in which you are forced to take rapidly growing banks of conflicting advice and make determinations of action with a predetermined acceptance for failure and the satisfaction in knowing that at least in failing fast you do so at the least cost of time and resources. What is your goal for the day after demo day? After demo day we are finalizing our runway for the final months of 2013. Our draft plan has been consistently evolving over the course of this summer as we have worked through a number of growing periods of development and discovery. We have a reasonable runway but long term survival and success in securing revenue in our market will require an infusion of cash to adequately cover our overhead costs and operating expenses for 2014. We have been developing relationships with potential Angel investors and hope to have outlined soft pledges and follow up for equity terms and financing in the months following our demo day presentation. Why did you choose this accelerator? 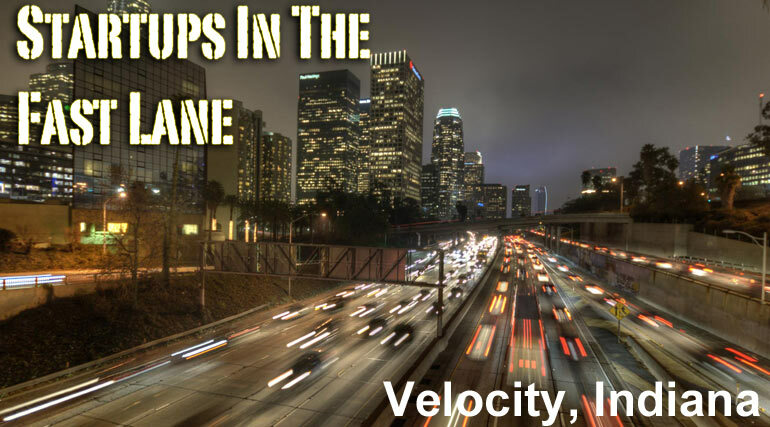 We are proud to be a part of Velocity Indiana’s inaugural class, we applied to a number of tech accelerator programs across the country but had our hearts set on Velocity because it kept us close to home, to our roots. The entrepreneurial community has been a blessing in resources and we are fortunate to have been able to establish so many close-knit relationships with the local business leadership here. If you relocated for the accelerator are you staying in your new city? Our two founders are from Louisville; our third core partner packed his bags to join us for Velocity all the way from Southern California and will be staying on with us here in Kentucky as we move forward from Velocity. What’s one thing you learned about an accelerator that you didn’t know when you applied? We didn’t realize how many opportunities were present to learn from and experience. To truly make use of all the resources of an accelerator program you need a committed team, willing and able to engage and participate reliably when and where they are needed. It can be difficult and there will likely be missed opportunities, but having the resources in time to follow-up and lead the people helping you build your project is essential in appreciating the value in an accelerator program. The physical and financial resources are a blessing, but the pool of talent, knowledge and experience that is available to offer guidance and leadership in overcoming challenges and obstacles is incredible. Check out our product at www.collabramusic.com and follow us at any or all of our social networks. You can also sign up for our newsletter and following our blog.